The United Nations hosted last March a consensus conference where governments and representative of drug users discussed the global state of Hepatitis C and recommendations raised from the practice. Track record. 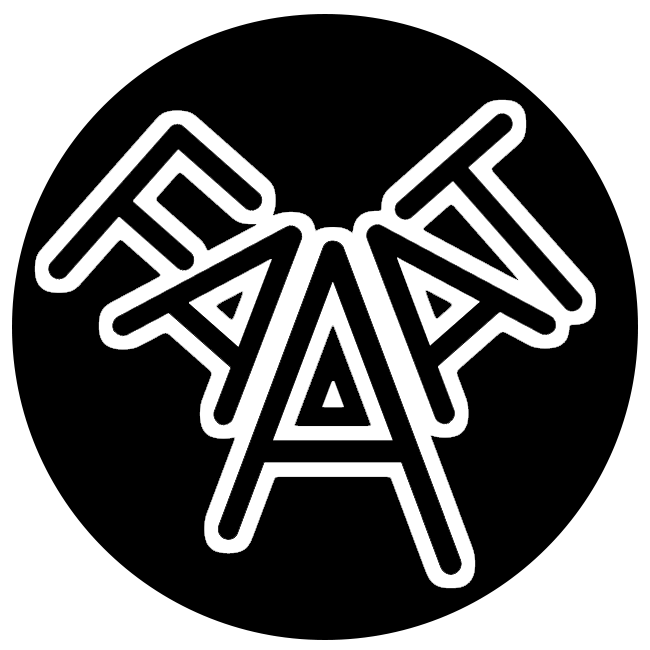 During the 61th Session of the Commission on Narcotic Drugs (CND) held in Vienna (Austria), FAAAT think & do tank, through the French NGO platform on international drug policy that we impulsed and to which we regularly participate, organized a conference entitled “Hepatitis C among people who use drugs – the global state and recommendations”. 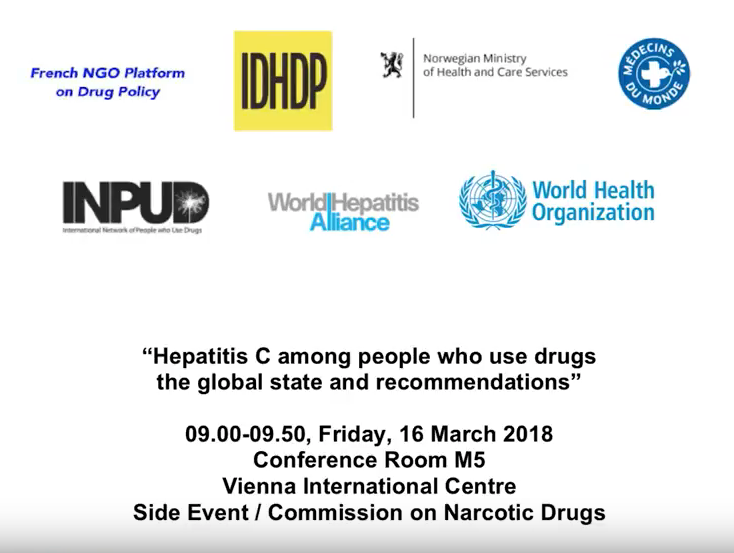 Besides the French NGO platform on international drug policy, the event was co-hosted by the World Health Organization, the Norwegian government, the International Network of People who Use Drugs (INPUD), the World Hepatitis Alliance, and the International Doctors for Healthier Drug Policies (IDHDP). This article was initially published in the CND blog (click here) and was authored by Claire Mawditt. The side event entitled “Hepatitis C among people who use drugs – the global state and recommendations” was chaired by Dr Judith Yates from IDHDP, who opened the session with the positive message that Hepatitis C is now curable and that emphasised that despite the challenges ahead we must not forget this major step forward. Dr Yates reflected on the history of Hepatitis C in the United Kingdom, in 1980s Birmingham there was very little awareness of Hepatitis C and a close of friend of hers contracted the virus during his youth but was only diagnosed in 2009 and sadly died of liver cancer at the age of 53. In this context Dr Yates welcomed the progression in both Hepatitis C diagnosis and treatment. A short film by the IDHDP was shown highlighting Hepatitis C as a major cause of liver disease globally, estimated to kill 700,000 people per year and accounting for a large proportion of liver transplants. In 2015 a new Hepatitis C treatment, known as Direct Acting Antivirals (DDA), which are able to cure 95% of Hepatitis C cases, became available but 2 years on only 1% have received the treatment. The film ended with the caption “TEST TREAT CURE … NOW”. Dr Yates went on to present the World Health Organisation’s (WHO) strategy on viral hepatitis (2016-2021). The strategy is ambitious with a vision to halt transmission and eliminate hepatitis C as a major public health threat by 2030. The strategy also plans to reduce new infections and reduce deaths. This strategy is crucial given that hepatitis C deaths are increasing, whilst other health-related mortality rates are in decline (e.g. AIDS, malaria, TB). Dr Yates explained that even with the effective implementation of Hepatitis C diagnosis and treatment Hepatitis C deaths are likely to keep going up for a period of time because older people with the virus are dying from chronic liver cirrhosis and liver failure. The WHO estimate that 71 million people have chronic Hepatitis C.
WHO emphasise that the global community must support harm reduction methods (e.g. needle and syringe programmes, opioid substitute therapy) in order to reduce new infections and engage people who use drugs who can be diagnosed and tested for Hepatitis C. The WHO also emphasised the need to address the stigma and discrimination experienced by people who use drugs and the stigma surrounding Hepatitis C. Moreover, they call for the decriminalisation of people who use drugs because people who use drugs are being incarcerated in overcrowded prisons which is leading to more Hepatitis C infections. The WHO point to research published in the Lancet in 2017, identifying the of the 179 countries where people who inject drugs are known to reside, only 93 have needle and syringe programmes and 86 have opioid substitution therapy. Moreover, currently people who inject drugs receive 33 needles each year, this needs to increase to more than 300 in order to effectively eliminate Hepatitis C.
In sum, WHO suggest that there needs to be a focus on health and harm reduction policies to meet the 2030 targets and that structural, political and legal frameworks are required in order to achieve this goals. A Norwegian perspective was given by Mr Torbjorn Brekke, who explained that Hepatitis C infections remain extremely high in Norway amongst people who use drugs. Historically, the 1985 HIV panic resulted in clean needles being made available from 1987 and this has led to success in reducing the prevalence of HIV to very low levels (8 people per year diagnosed with HIV). However, today 10,000 to 15,000 people in Norway show signs of having/or have been affected by Hepatitis C, the majority being people who inject or use drugs. In order to successfully eliminate Hepatitis C countries must do more than implement harm reduction programmes. There is also has to be a change in social norms, identifying that Hepatitis C does not have to be a part of life and that countries need to take responsibility for this problem and value the lives of people who use drugs. In 2015, Norway launched a Hepatitis strategy, on the basis of the WHO Hepatitis resolution 2014. This strategy was heavily criticised because it focused heavily on prevention rather than treatment. On a positive note, Norwegian authorities have managed to negotiate an acceptable price DAA medication. These medications are being delivered in Oslo hospitals demonstrating that people who are affected by Hepatitis C can receive treatment and be cured. Next year Norway is considering a CND resolution that focuses on Hepatitis C, Dr Brekke encouraged all stakeholders to push for this and to offer assistance. Jean-Michel Tassie provided a French perspective on Hepatitis C, identifying that DAA treatment became available in 2014 and since then 60,000 people have been treated, which is a major step forward. However, 100,000 people have chronic Hepatitis C in France who are eligible for treatment, the majority being people who use drugs or migrants, two groups with very limited access to care. France is committed to simplifying the treatment process and rolling it out to community-based services, because currently it is only available via prescription from specialist liver clinics in hospitals. There is also a need to improve the diagnostic and treatment pathways in prison settings, for instance making sure people are followed up in the community when they start treatment during a short prison sentence. France is reinforcing the elimination goals and see curative Hepatitis C treatment as prevention, which should be dedicated to all citizens and should target people who use drugs. Treating one person for Hepatitis C can prevent transmission to ten more. Access to treatment for vulnerable populations such as people who use drugs and migrants must be a priority and there should be a combined approach with other blood-borne viruses, Hepatitis B and HIV. An integrated approach between liver and addition specialists is important in order to implement rapid testing and treatment for people who use drugs. Alongside strategies to improve health and harm reduction policies, a political framework has been published which consider Hepatitis C and an operational plan is due to be published in the next few weeks. Dr Yates applauded France’s efforts to eliminate Hepatitis C and highlighted how this is a good example for other countries including the United Kingdom. Bikas Gurung from ANPUD provided a people who use drugs perspective to the global Hepatitis C response. He reminded those present that people who use drugs are typically excluded from Hepatitis C diagnostic and treatment opportunities. Many people who use drugs have self-medicated with Hepatitis C treatments to cure their illness because they are discriminated against by mainstream health services. In order to eliminate Hepatitis C, treatment programmes must include peer support workers that can reach people who use drugs with diagnostic and treatment messages. Currently many myths exist around Hepatitis C and awareness of the virus and how to get tested and treated is very low amongst people who use drugs. Activists in this field who are serving their local communities note that access to DAA treatment and diagnostic tests is very expensive. For example, some affected by Hepatitis C in Thailand was assisted by Civil Society to purchase medication from India, reducing the cost from $5000 per month to $1000 for 6 months. People who use drugs have to break rules and regulations in order to save lives because of the price and regulatory barriers that currently exist. Civil Society is an important level to advocate on behalf of people who use drugs and break down these barriers. Whilst reduced prices has led to increased access, this has occurred because of the voices of communities. Moreover, the price of DAAs is still too high and diagnostic costs can be higher than the DAA medicine themselves. Civil Society Organisations sit on national plans to eliminate viral hepatitis in India. PKNI (Indonesia) is one of strongest advocacy voices and has helped many people who use drugs access treatment. Activities are also taking place in Nepal, Thailand, Malaysia and other countries in the region lobbying for affordable diagnostic and treatments for Hepatitis C.
All member states must meaningfully engage Civil Society Organisations and people who use drugs in order to effectively eliminate Hepatitis C.
It has been well-established that criminalising people who use drugs acts as a barrier to receiving effective testing and treatment for blood borne viruses (such as HIV and Hepatitis C). Unfortunately, people who use drugs are not a priority by governments and are often the targets of politically motivated war on drugs leading to people who use drugs being arrested and murdered. For example, in 2017 the Indonesian government killed 107 people who use drugs and Cambodia arrested and incarcerated 1,700 people who use drugs. The UN high commissioner for human rights has raised the human rights violations experienced by people who use drugs. However, human Rights are not held in esteem with the other two pillars of UN (peace and security, development). After more than 50 years, people who use drugs are seen as an enemy of the stated, a public nuisance, victims and mentally impaired. Many of the activities that Civil Society Organisations have contributed to eliminating Hepatitis C (e.g. peers to access health services, protecting from human rights, harm reduction messages, developing evidence based policies), could have been much more effective if people who use drugs were not criminalised. Globally, we need to abolish systems that victimise and/or treat people who use drugs differently. This system will stop us from eliminating Hepatitis C. Governments must acknowledge the contribution of people who use drugs and see them as a vital component in the solution. “Nothing about us without us”. Dr Yates reiterated the need for governments to meaningful involvement of people who use drugs in order to effectively eliminate Hepatitis C.
Celine Grillon thanked Bikram for bringing voice of the people who use drugs community. Celine provided the perspective of Civil Society Organisations calling for change in drug policy both in France and internationally. Celine identified that the global strategy is to reduce Hepatitis C infection by 90% and expressed her excitement that this issue is being taken seriously at the CND. Celine highlighted how Hepatitis C infections disproportionately impact on people who use drugs and that we cannot eliminate the virus if we do not reach people who use drugs. There is a current lack of effective harm reduction measures being implemented with many people who use drugs (approximately 30%) facing barriers to receiving clean needles in France. There is also a lack of data. Ignorance exists within communities which fuels stereotypes and reinforces stigma and discrimination. Moreover, criminalisation of drug use and possession has led to the incarceration of people who use drugs and subsequently interruption of their Hepatitis C treatment. Universal access to prevention and treatment (e.g. scale up of harm reduction services, remove treatment restrictions, decrease price of diagnostic tests and treatments). Hepatitis C care, peer support programmes). Increase knowledge and policy implications for people who use drugs (e.g. involving them in the design of testing and treatment services, “nothing about us without us”). Fight stigma and discrimination (e.g. addressing the attitudes of health care providers through training and workshops). Reform law and policies which can address the barriers that hinder harm reduction services from reaching those that need them and provide an enabling environment for people who use drugs to access treatment and testing (e.g. decriminalisation of minor non-violent drug offences, implement public health and human rights orientated drug policies). Implementing Hepatitis C related agreements from the 2016 UNGASS outcome document. Adopt resolution on Hepatitis C.
Align drug policy with sustainable development goals and health-related objectives and scientific evidence. Ensure Hepatitis C is addressed in post-2019 in the global drug strategy.